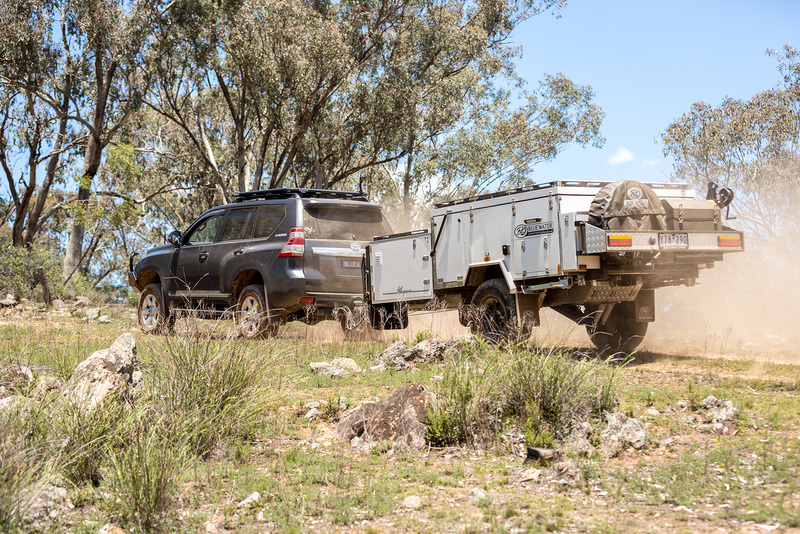 When our judges scrutinised the Bluewater Macquarie, they were deeply impressed by its comfort, ease of use and inventiveness, and with how these factors take the front seat without impacting the camper’s offroad-ability. They observed the close attention to detail that had gone into its design, construction and features, and scored it accordingly. The Bluewater Macquarie is an impressive forward fold that shows the benefits of endless attention to detail, with every single aspect of the design and execution given close thought to improving its functionality. 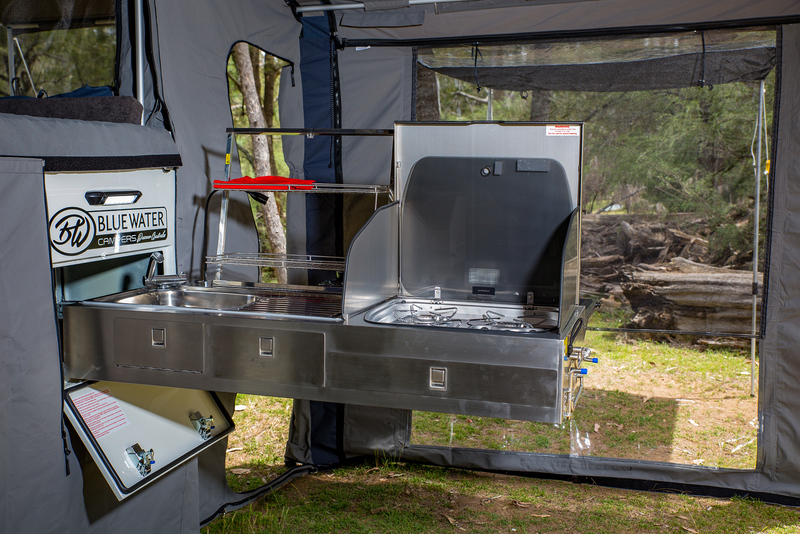 The Bluewater campers are all founded on import core components – chassis, body and some major items such as the kitchen – helping to minimise cost. But components are then finished off locally, with local wiring, plumbing, gas, suspension components and Wax Converters canvas giving buyers confidence in the camper they’re purchasing. The 120x50x4mm drawbar runs back to the suspension mounts, with a 75x50x3mm main chassis above. Everything is hot dip galvanised and coated with underbody deadener for noise reduction and extra protection. The suspension is trailing arm independent with Lovells springs, twin Ride Pro shocks, progressive poly bump stops and 10mm poly packers top and bottom of the springs (to reduce harmonics in the suspension). The 12in Dexter electrical brakes mount black 16x8 Primal Alloy rims and 265/75R16 all terrains on six-stud hubs. The coupling is a McHitch 3.5 tonne item and the dual wheel Ark X Series jockey wheel holds the package off the ground. At a Tare of 1500kg and an ATM of 2400kg, this is a big camper, but it comes with a breakaway system and a ball weight of 125kg when empty (around 180kg when fully loaded). Bluewater demonstrate their confidence in their product with a five year structural, springs and canvas warranty, and three year water system and shock absorber warranty – among the best you’ll find in the industry. 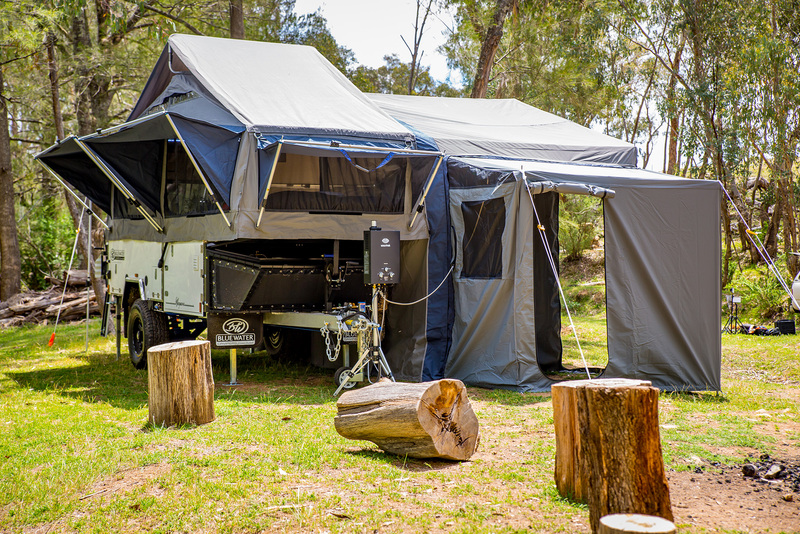 The Bluewater Macquarie is quite a camper and if you’re looking for a forward fold you ought to take a look at these. They may not be the lightest, but they are certainly well appointed. The latest Bluewater Macquarie is simply exciting. It is the Shangri-La of forward fold campers! It comes from a company that started with the basics and has since developed into market leaders, through their continual research and development based on years of experience. Now, Bluewater can truly stand proud as the producers of perhaps the most user-friendly forward fold camper on the market. Who said camping had to be hard work? I mean, it’s a real win when the camper’s structure assembles into a tent, without requiring fiddly adjustments thanks to its spring-loaded framework. This structure gives you the flexibility to either simply use the fold-over for an overnighter or to set up a home base for the entire family – who ought to fit easily, given the huge 6x2.4 metre annexe, kids’ room and ensuite. The presentation is superb, with a terrific undercarriage that will dependably follow you through the rough stuff. The paint quality is only matched by the premium Wax Converters canvas that is expertly trimmed and manufactured with plenty of windows, midge proof flyscreens and awnings. All of the steel componentry is tough and heavily reinforced. The stainless steel kitchen is ideal, with plenty of bench space and wind deflectors around the cooktop. The array of sensible components is yet another huge tick to its name. Storage isn’t going to be a problem for those using this unit. There’s plenty of long and large compartments, including a fridge slide suited to the largest portable fridges. If you’re the boating kind, rest assured that the top of the camper has a loading and tie down facility. Comfort isn’t going to be in question either. The internal upholstery, thickly padded cushions and sleeping arrangements all make sure of that. Overall, the packaging is unique enough to stand out, while also managing to stay sensible and well-considered. And all for a reasonable price! I was impressed by the thoughtful considerations and attention to detail throughout Bluewater’s Macquarie forward fold, as well as the quality inclusions in the $34,900 package. This four-berth camper is very comfortable with its foam-topped, queen size innerspring mattress and U-shaped dinette with a drop-down table that makes up the second bed – an inclusion that makes this ideal for growing families. 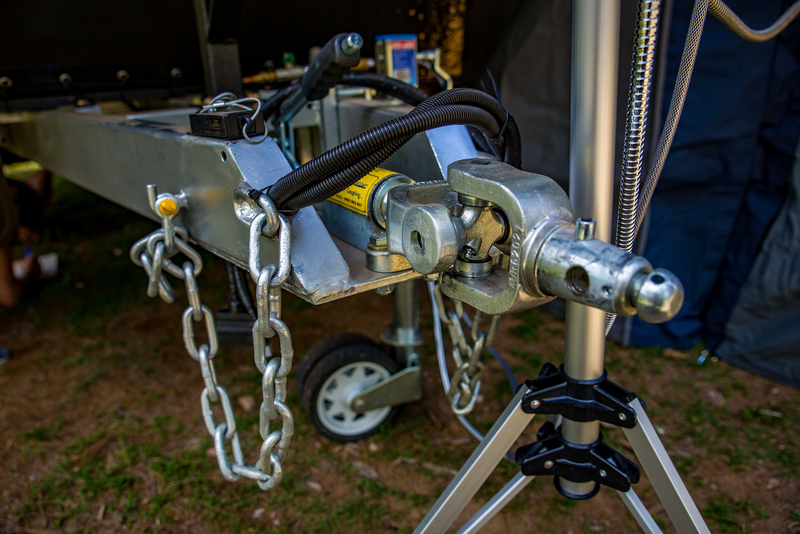 Setup is easier than many of its ilk, with gas-strut assisted, non-adjust, spring-loaded poles for the main tent, which has quality 14oz Wax Converters canvas. 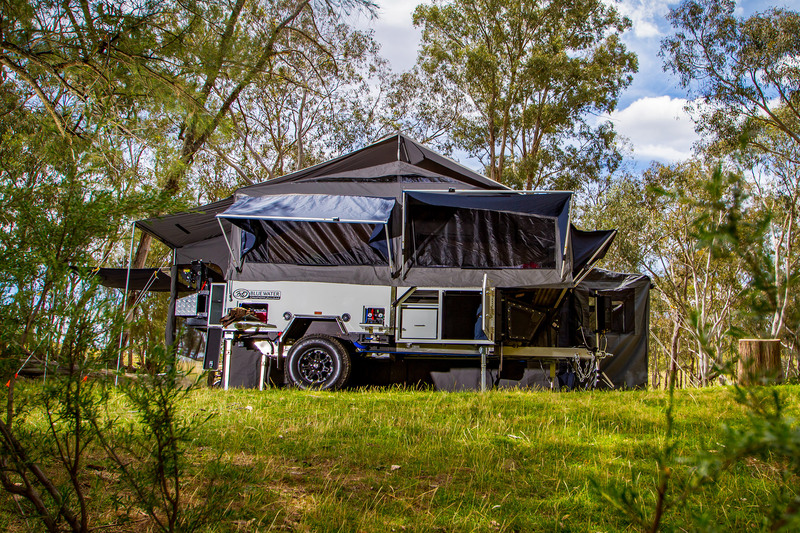 The small, velcro-on touring awning is a good concept for short stopovers and the Macquarie was actually one of the fastest to get to ‘overnighter’ stage at our REDARC CTOTY setup competition. 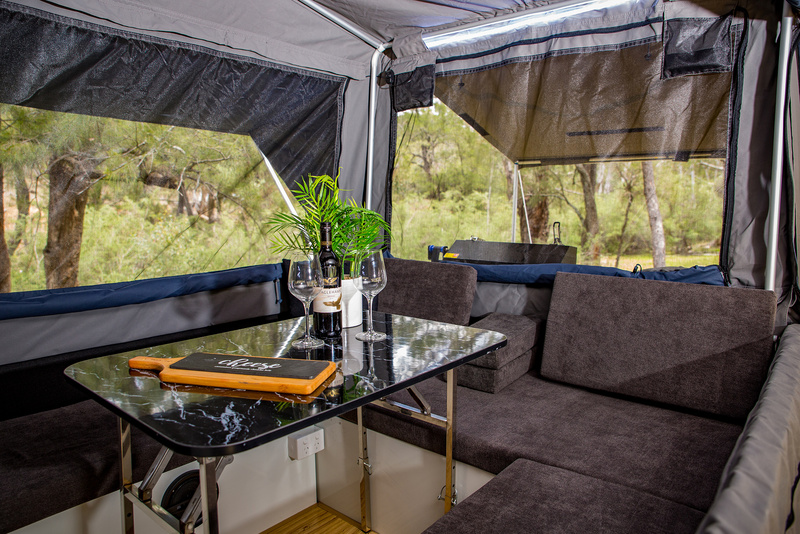 The full awning provides a spacious 2.4m wide living area, with an additional 200mm strap running off the edge of the camper for easier zip-on attachment. There was plenty of undercover living area for a family, although the attached ensuite is not my personal preference (albeit not an uncommon design). The camper’s deeper tub means the dinette seats are at a comfortable height, and results in more storage, as well as space for a bigger fridge. Small pockets at each corner of the interior are useful for storing items you want close at hand and the adjustable window awnings allow for ventilation in tropical downpours. The three-burner cooktop is nicely shielded on three sides and there’s good bench space in the kitchen, with a flip-over bench running the full length of the slide. Included is a WAECO 95L fridge/freezer in an insulated fridge box, and the one-handed fridge slide unlatch bar makes it much easier to use the fridge slide when your hands are full. Conclusion? This very liveable camper features plenty of thoughtful innovation, without ever forgetting about the most important person, the user. 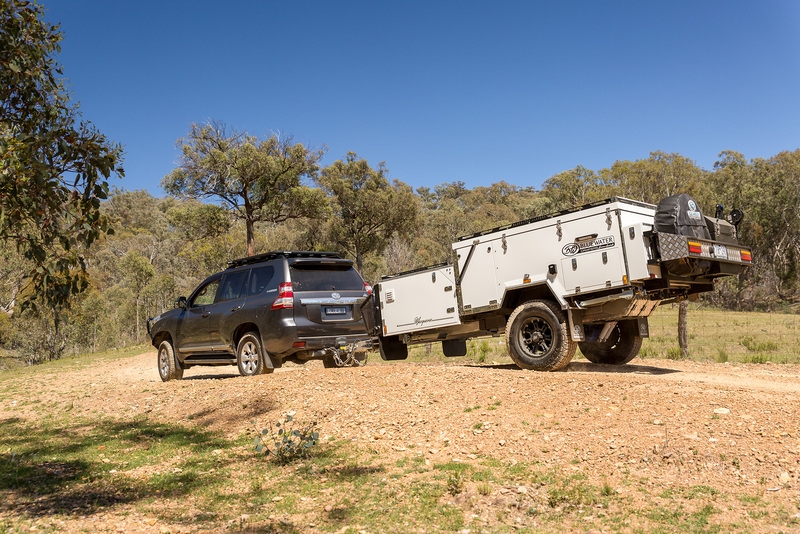 Forward fold campers have taken this price point of the camper market by storm in recent years, and it’s easy to understand why. But some brands pack more in for the dollars, or prioritise different elements. For those wanting to get away from the crowds and be independent of the grid, the gas, water and electrical systems become all important. 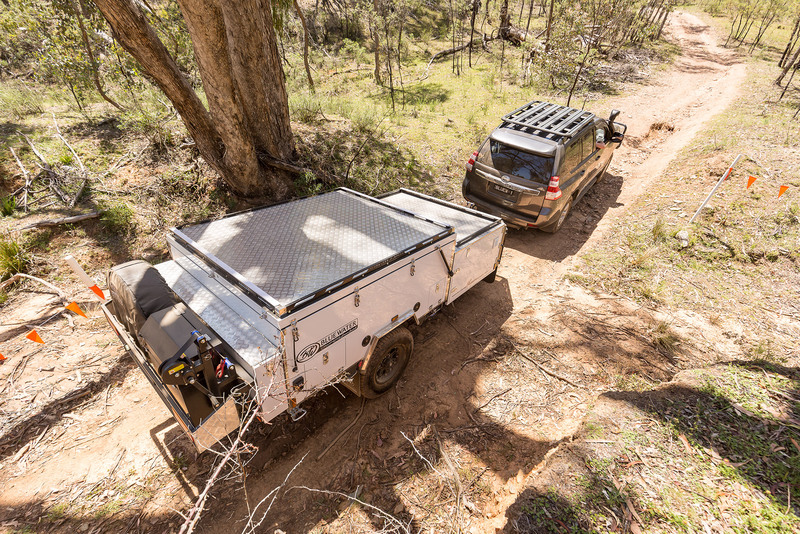 Water-wise, the Bluewater Macquarie has two stainless steel water tanks totalling 160 litres, along with two jerry can holders which could easily carry another 40 litres of the life-sustaining fluid. The water tanks are plumbed to the sink and the hot water connections via a Seaflo 42 Series pump. This pump is a 9.5L auto demand diaphragm unit providing strong water flow. A portable Smarttek hot water system ensures you have hot water on demand at the sink and shower. Two gas bottles ensure you have plenty of fuel to keep cooking, and a three-burner Dometic stove completes the gas system on this well set-up camper. The electrical system includes a 240 volt installation with a 15 amp inlet, one 10 amp outlet and three double power points. 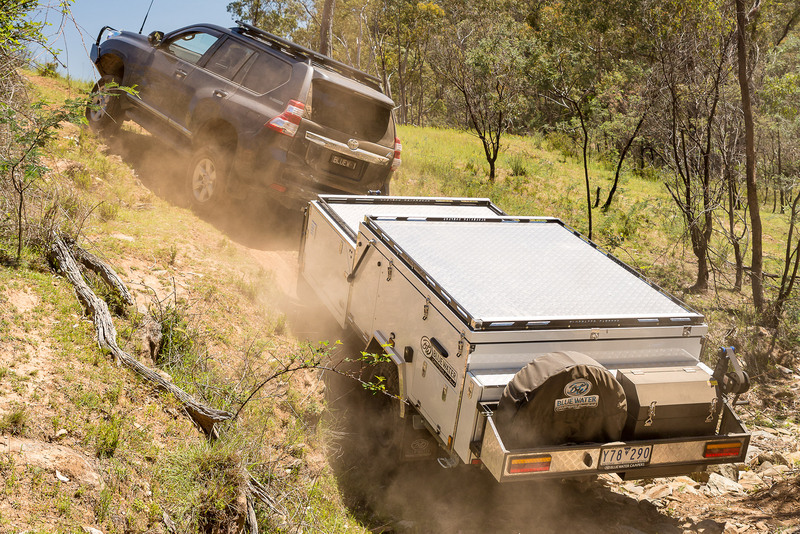 A Projecta 21 amp, seven-stage battery charger makes sure your batteries are well charged before heading bush. 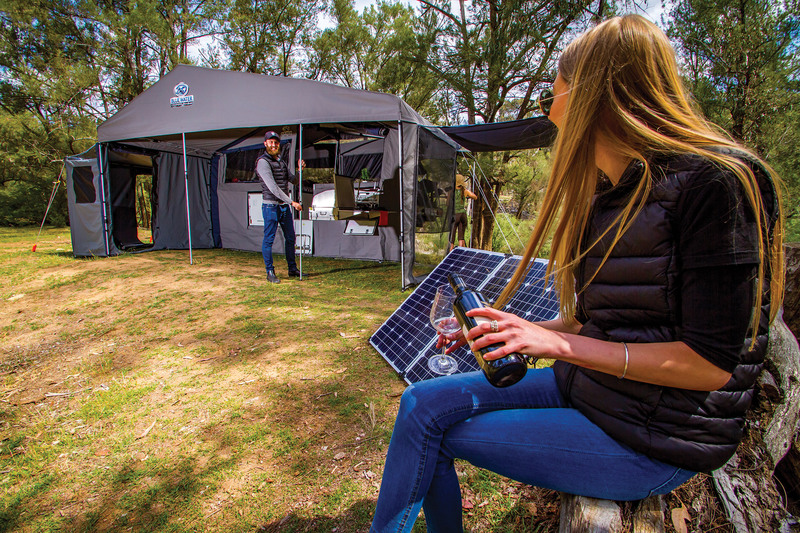 On the DC 12 volt side, which will keep you free of mains power for as long as you want, there are two 100Ah AGM batteries, a CTEK 250SA DC-DC charger, and a premium 200W folding solar panel. There are numerous 12 volt sockets and USB outlets for all your charging and power requirements, while all LED lights are touch activated. The sound system has an MP5 touch display screen with Sony speakers. This is all managed by a digital control panel that includes a voltmeter, battery display, master isolation switch, circuit breaker and rocker switches for individual control of electrical components. What I really liked about this camper was the thought that has gone into the delivery of power and water to the pull-out fridge and kitchen. This is done by a ‘Drag Chain’ system, which is the best way of bringing water and power to roll-out components that I’ve seen to date. It caps off the list of features making this a dependable outback camper.